Sometimes you need to lock on a specific cell tower due to bad cell conditions such as low data speed or because you need to test another nearby cell condition. I will teach you how to do that on Samsung Galaxy S6. You need to run a secret code but Samsung has prevented you to run it from the phone Dialer, so you need to root your phone and manually execute the command. Do the job at your own risk. We won’t take responsibility if any damage is caused. – A rooted Samsung Galaxy S6 / S6 Edge. 1. Open Terminal Shortcut app. 3. Check ‘Run with root privileges’ and un-check ‘Show output’ then tap save. Before you begin, there are 3 pieces of information you need to get from LTE-BASIC Info window. you can open the info window by dialing *#0011# or running the previously created shortcut and go to Protocol > Basic Information. 1. Go to UE Setting & Information > Setting > Protocol > AS > Frequency Lock > LTE Cell Locking. – Band: The band on which your LTE provider operates. – EARFCN: Equals to DL Frequency. – PCI(Physical Cell Identifier): To lock on a specific cell, you need to know PCI numbers of the cell towers around you, unfortunately you can’t get a list of neighbour cells from your device so you need to collect them by going near the cell towers and write them down. 1. Get neighbour cells PSCs from Protocol > AS Information > Neighbour Cell Information. 2. 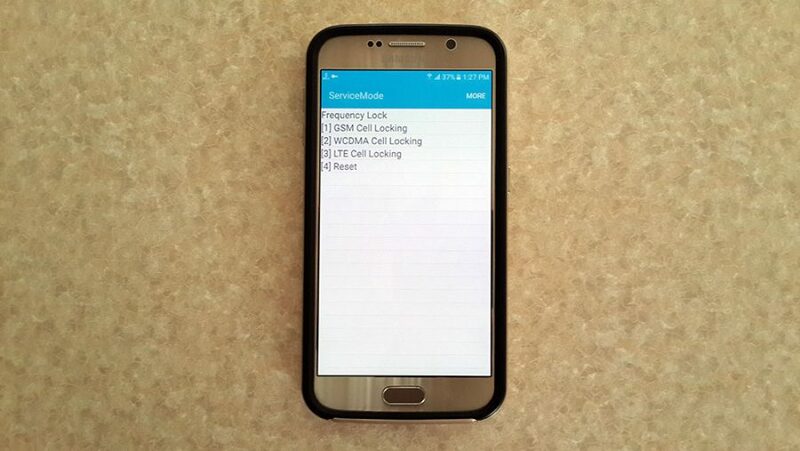 Go to UE Setting & Information > Setting > Protocol > AS > Frequency Lock > WCDMA Cell Locking. 3. Set Band, UARFCN and PSC then tap on Cell Locking. 4. Turn On/Off Airplane Mode. 1. Get neighbour cells ARFCNs from Protocol > AS Information > Neighbour Cell Information. Values displayed here are in HEX, you need to convert them to DEC.
2. Go to UE Setting & Information > Setting > Protocol > AS > Frequency Lock > GSM Cell Locking. 3. Set Band and ARFCN then tap on Cell Locking. 1. Go to UE Setting & Information > Setting > Protocol > AS > Frequency Lock > Reset.